An Mi-28N “Havoc” attack helicopter from Russia’s Golden Eagles aerobatic display team lost control during one of the team’s signature maneuvers and came spinning to the ground. 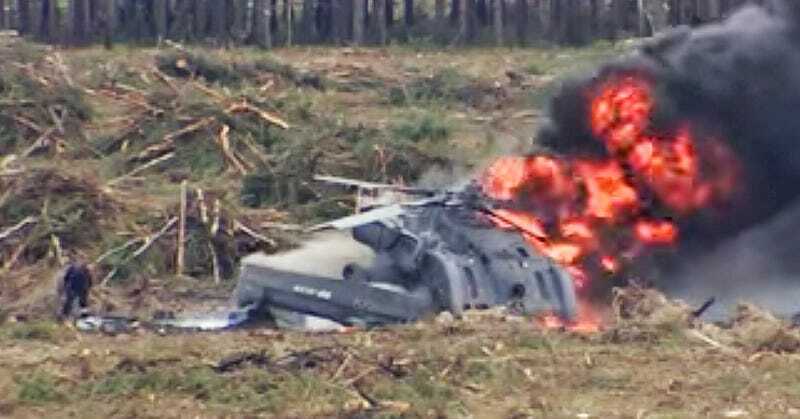 Amazingly, one of the helicopter’s two crewman escaped the wreckage largely unscathed, while the other was killed. The display was part of the Aviamix air show, one of the most prominent in Russia, which also coincides with the international Aviadarts aerial combat competition held partially nearby. The Golden Eagles’ spectacle has caught our attention before, as formation helicopter aerobatics is increasingly rare, and the stuff this team does with their new Mi-28N Havocs is just eye-wateringly beautiful. As a result, all of Russia’s roughly 100 Mi-28s have been grounded until a deeper investigation into the incident can be made. The Mi-28 was supposedly designed with an ejection seat system that fires its crew out the side and downward. It is not clear if using such a system would have saved the pilot’s life in this case or if it is even operationally in use. Russia has had six military aircraft crashes in as many weeks, today’s being the seventh, with both newer and older aircraft being affected. This has caused internal and external questioning as to the combat capability of Moscow’s flying forces and has catalyzed a search to identify systemic issues that could be causing the near constant losses. This weekend has been a particularly bad one for aviation, as four high profile crashes happened yesterday. One of these also happened at an air show, with a Folland Gnat spinning into the ground in Cheshire, England.